The Istick is back! This baby version of the Istick Pico brings with it a trip back to it's original ultra portable design and packing 25 watts for all of the fans of mouth to lung vaping. With a juice capacity of 2ml and a resistance range from 0.4 to 3 ohms you'l power through your favorite liquids in a very stealthy manner. With it's built-in 1050 mah battery all you need to do is provide the device juice and the and the occassional coil change to vape in a simple easy to use manner. Great for begginers, vapers who don't require super low sub ohm levels, and those who enjoy a good mouth to lung vape. Eleaf has gone back to its roots, you should follow them there and find excellence for yourself. 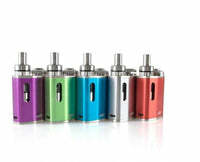 Eleaf Istick Pico Baby 25W Kit - Eleaf has a rating of 4.9 stars based on 8 reviews.